Treatments for non-healing wounds include compression therapy, negative pressure wound devices , skin grafts [16, 17] and tissue bioengineering [18–20], as well as cell therapy  particularly using mesenchymal stem cells (MSC). These cells, known to enhance wound healing, have been broadly studied in clinical trials. Contrary to the early paradigm of cell replacement and differentiation as a therapeutic mechanism of action, evidence is mounting that the secretions of the MSC are responsible for their therapeutic effects . These secretions include molecules and extracellular vesicles that yield both local and distant effects. The most important factors present in a conditioned medium of MSC can also be considered protagonists of MSC physiological effects including HGF, TGF-b, VEGF, TSG-6, PGE2 and galectins 1, and 9 . It is important to note that fresh amniotic membranes contain live MSCs while dehydrated amniotic membranes do not. Rather, dehydrated amniotic membranes (as in the case of the AlphaPatch) function as a biologic scaffold to facilitate and enhance tissue regeneration and rehabilitation by way of the said molecules in addition to PGE2, WNT4, and GDF-11 . 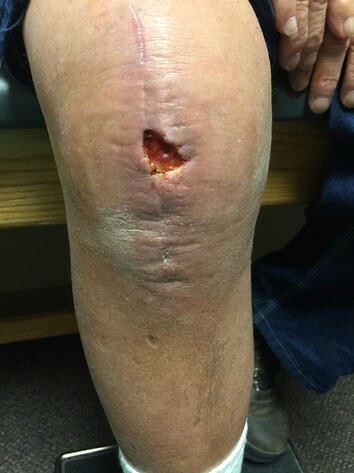 A 78-year-old male with history of prostate cancer and COPD, with a 40-pack-year history of smoking presented for a follow-up visit in the clinic 17 days status post right total knee arthroplasty. During this visit, dermal staples were removed from the surgical incision. The mid portion of the patient’s incision showed some wound dehiscence, representing the same location in which the patient reported a previous sebaceous cyst. Cleocin 300 mg qid was prescribed as antibiotic prophylaxis while Talwin 1-q4prn was prescribed for pain control. The dehisced area was thoroughly cleaned with alcohol and triple antibiotic while the remainder of the wound was Steri-Stripped. One week later, the patient presented to the clinic for follow-up of the wound dehiscence. Upon physical examination, the wound appeared macerated and white with initial signs of necrosis. The wound was cleaned with alcohol and compressed with Ace bandage. The patient continued to take Cleocin antibiotic regimen. Eleven days later (35 days post surgery), the patient returned to the clinic to recheck the wound. The wound showed slow healing with no significant drainage. To expedite the healing process, three Monocryl sutures were used to close the wound. 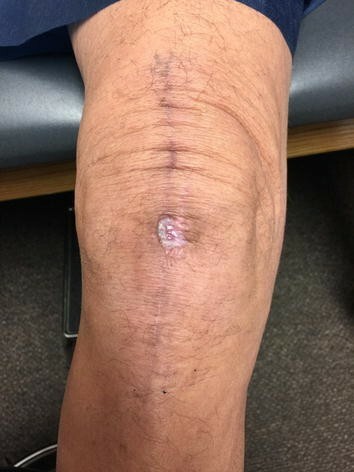 One week later (or 42 days post surgery), the patient returned to the clinic reporting that the three sutures expelled while he flexed his knee during physical therapy. The non-healing wound displayed a sympathetic effusion consistent with vasculopathic venostasis resulting in a surgical ulcer. The wound, however, was not erythematous, hot, or tender to palpation. The patient was scheduled the following day in the OR for drainage of joint effusion with gram stain, knee wound irrigation with pulse lavage, and application of amniotic dry patch to wound. The right lower extremity was sterilely prepped and draped in the usual fashion, roughly 2 months status post total knee arthroplasty. The joint effusion was drained, and 65 cc of bloody synovial fluid was removed from the patient’s right knee. STAT gram stain of the aspirate revealed negative results. The wound was then irrigated with three liters of double antibiotic solution under pulse lavage. Two (4 cm × 4 cm) dry amniotic AlphaPatches (Amniotic Therapies, Dallas, TX, USA) were placed over the wound with Acticoat applied on top. Then 4 × 4’s, Webril, and Ace wrap were applied to the knee. The patient tolerated the procedure well and was transferred to the recovery room in stable condition (Fig. 1). At the two-week follow-up visit (following the incision and drainage of the wound dehiscence and application of the amniotic AlphaPatch), a central scab had formed in the middle of the wound dehiscence area (Fig. 2). At the four-week follow-up visit, the wound dehiscence area had completely scabbed over with no open areas left (Fig. 3). At the eight-week follow-up visit, the scab had just fallen off, and the wound was healing well with immature skin representing the size of a penny (Fig. 4). At the ten-week follow-up visit, the wound had completely healed (Fig. 5), patient demonstrated full knee ROM (120° of flexion and 180° of extension), and patient was released from orthopaedic care. Two weeks post-lavage and amniotic Alpha Patch application. Four weeks post-lavage and amniotic Alpha Patch application. Eight weeks post-lavage and amniotic Alpha Patch application. Ten weeks post-lavage and amniotic Alpha Patch application. 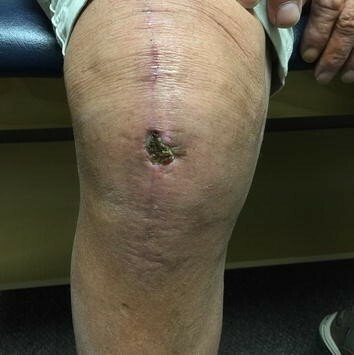 Although the 78-year-old patient demonstrated excellent results in ROM and overall decreased pain levels following right total knee arthroplasty, the non-healing status of the surgical wound at even 42 days status post surgery posed great concern. The vasculopathic venostasis resulting in a surgical ulcer left very little option than to perform dehiscence wound irrigation with pulse lavage and to apply dry amniotic AlphaPatch to the wound. The amniotic AlphaPatch, a dehydrated amniotic tissue allograft, contains the molecules PGE2, WNT4, and GDF-11. Mesenchymal stem cells (MSCs) secrete PGE2, or Prostaglandin E2, in response to injury. This molecule inhibits fibrosis by way of limiting fibroblast proliferation, migration, collagen secretion, and transforming growth factor (TGF)-induced myofibroblast that can spur fibroblast proliferation . PGE2 also enhances the wound healing process and angiogenesis . WNT4, a protein, drives wound healing by way of wound re-epithelialization and cell proliferation . The creation of new tissue materializes by multiple methods including new blood vessel formation, a critical element for normal wound healing . GDF-11, or growth/differentiation factor 11, has been identified as one of the key molecules propelling the regeneration of skeletal muscle, cardiac muscle, and nervous tissue in aged mice . The two dry amniotic patches applied on the patient’s wound substantially accelerated the wound healing process. 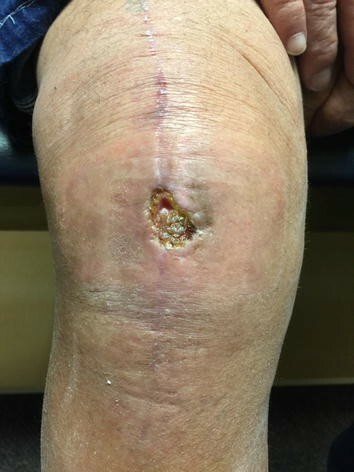 The dehisced surgical wound that showed no sign of healing even after 42 days post total knee replacement surgery, demonstrated a central scab formation in the middle of the wound dehiscence area only after 2 weeks of amniotic patch application. 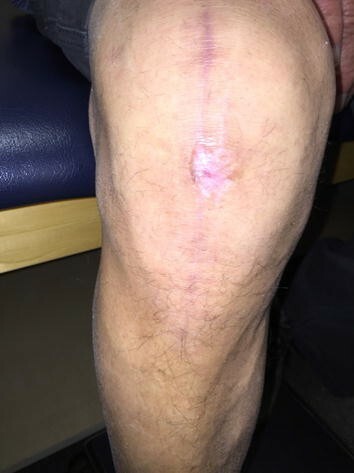 After eight more weeks, the wound was completely healed and the patient was released from orthopaedic care to assume high levels of physical activity and activities of daily living. Although more studies are warranted to further substantiate the therapeutic benefits of this treatment, we suggest unreservedly that dehydrated tissue allograft patches derived from human amnion embody a viable and more effective alternative to current traditional means of wound care management. NHR, BAG, and RWM contributed to the development of the medical procedure, concept, literature review, discussions, and writing of the manuscript. TBC participated in discussions, literature review, followed the subject of the case report, and provided photographs and procedural notes. All authors have read the manuscript and agree to its submission. All authors read and approved the final manuscript. Competing interests R. Wade McKenna and Neil H. Riordan are shareholders in Amniotic Therapies, LLC.